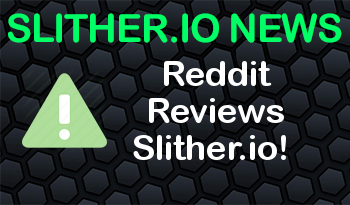 Slither.io Review | Reddit Reviews Slither.io! Over all to keep it short I like the game and would give it a nice 7.5/10. Thats quite high compared to other online and mobile games ive played. Slither.io is fun and addictive. Many things are unique from its addictive .io predecessor but some the same. Some things better than its precursor and some worse. Over all to keep it short I like the game and would give it a nice 7.5/10. Thats quite high compared to other online and mobile games ive played. Now what makes it good and sets it apart. Slither.io is a fast paced game where you have to beat out other snakes in battle to try and hold the top score not really for the biggest but longest as it takes more skill to stay on top for 10 minutes than to grow to an astronomical size. (Unless you use hacks or cheap tactics) Its fun because of that fast paced nature but also quite angering as you can go from top of the world to nothing more than a long strand of bright glowing orbs for other tiny slithers to gobble up. Sadly that also brings me to its negitive. Even if Agar.io, Slither.ios predecessor, ended up just getting bought out and riddled with hackers I still like it a bit more than Slither.io for a few reasons. One of them being Slither.io requires very little strategy and thinking. Within the first few hours of play I learned all the good moves to take the #1 spot everytime mostly by the best strat to go from 0-100, the kamikaze attack, when you first spawn all you have to do is slam right into the head of the largest snake and BAM instant #1, this really kills the mood even if it gives you a good minute or two of enjoyment because the exact same will happen to you, and the downfall is worse than the rise. This is one of the biggest reasons why I like Agar.io more than Slither.io because of how complicated and convluted it is to master Agar.io compared to Slither.io, I masterd Slither.io within the first few days but for Agar.io I still greatly struggle getting #1 everytime. I do see the reason why alot of people appeal more to Slither.io now than Agar.io, I even do for that matter, and those reasons being that Agar.io is nothing more than a sellout game that is riddled with lag and hackers it makes it unenjoyable, but Slither.io still doesn’t have alot of that yet (lag is still there and just as bad as agar.io) but I see within a few months just like Agar.io this game too will become filled with bots and hackers. Then again the devs of Slither.io seem very smart about what their doing as their design and coding skills are far better than most online games including Agar.io. The bright capitavating colours and huge arena makes it very fun to play in and not near as borning as Agar.io (except you cant play music while on the app, and that really drops my liking to it alot as a game without any sound is ultra boring) For me I see a bright future for this game and hopefully it wont get overtaken by hackers, bugs, and bots so it can stay enjoyable until a better idea comes along that beats this one. I will be playing Slither.io for a while now and still if I like Agar.io better I will be playing Slither. Thanks to the Devs for making a fun colourful and addiciting game and please keep making it better (plz add sound or at least allow music to be played in the app) Thank you! As a side note to the Reddit Mods, the rules page is broken and dosent have a link so I couldn’t check if anything im saying is aginst the rules or not. So if you wouldent mind updating that so I can make sure im not saying anything aginst rules, and if i am and you want it fixed now send me a pm or just take down my post, I wont be mad.